A traditional Ibicencan style villa with a large pool, surrounding terrace, and ample outside spaces for relaxing and dining, with views over the valley. Bright and spacious, the villa is well equipped for your comfort and in a great location ; all points of Ibiza are easily accessed! It is also near to some fabulous restaurants like Bambuddha Grove, Es Caliu, and the laid back eateries of the village of Santa Gertrudis. Fully enclosed with security gates, this is ideal for young groups who want to explore the island and get around easily, as it is near the centre of the island and good connecting roads. Close to road to Santa Gertrudes. Ideally situated, a 10 mins drive to Ibiza Town in one direction and in the opposite direction the town of Santa Eulalia. The villa is private, yet it is only 5 mins to the small country village of Santa Gertrudis, a unique place worth visiting day or night. 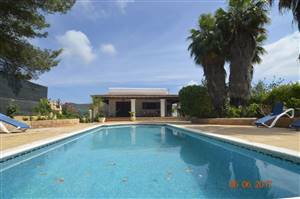 Easy access to the beaches of Benirras, Sta Eulalia or Cala Llenya. This house is built to keep it cool during the summer months. The rental period is variable, Check in 14.00 on the day of arrival through to 10.00 am on departure day, this is necessary to allow for cleaning and preparation for arrivals.Linen provided. Out of season rentals available, prices on request.